This is the driver in a 6A and 9A version. The parts on this side is options, both circuits has the moonlight mode mounted and one of the circuits has the high voltage option mounted (Up to 8.7V). Support 100k NTC for temperature protection. 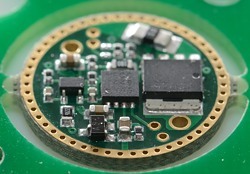 Typically 40uA parasitic drain on low volt version. Typically 200uA parasitic drain on high volt version (This is more than a year with a 2500mAh cell). This driver is designed by led4power and is his second generation driver with some improvements. 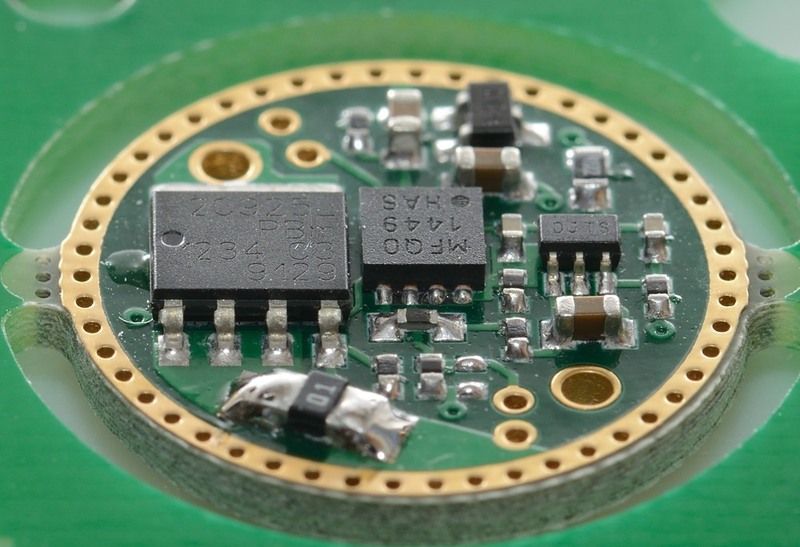 The driver is a linear driver using a large power mos transistor to drop the voltage without any pwm. 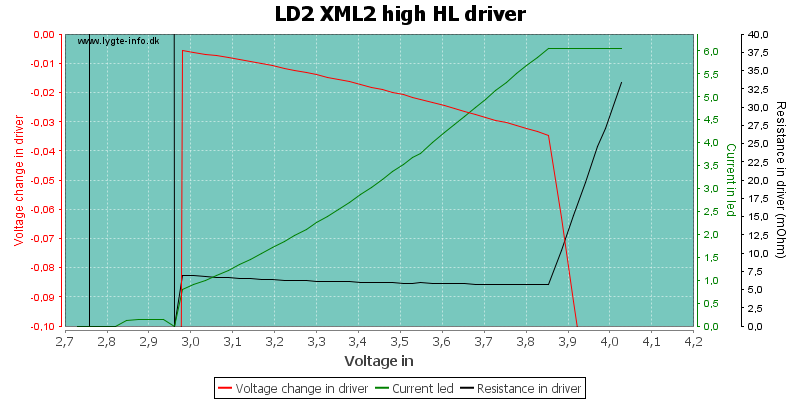 By replacing a resistor the driver can handle very large current. I have tested both a 6A and a 9A version. The driver has multiple user interfaces, it can use a tail switch and it also has support for a electronic switch. The electronic switch can use one of 3 different user interfaces. Depending on selected interface the driver can be with or without mode memory. 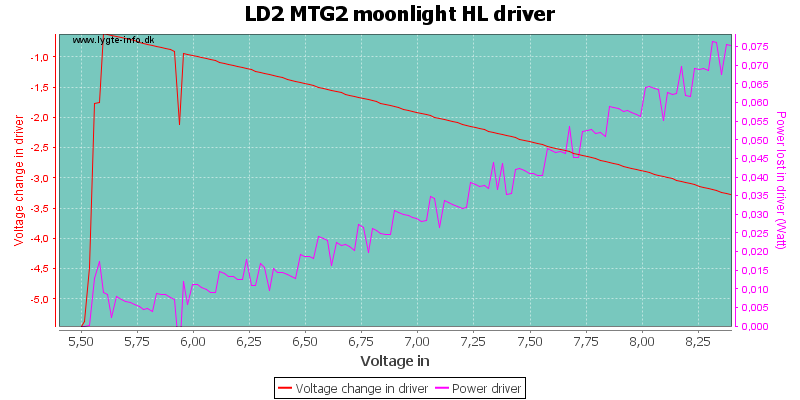 The driver has 3 or 4 modes (This is selectable): (moonlight), low, medium, high. 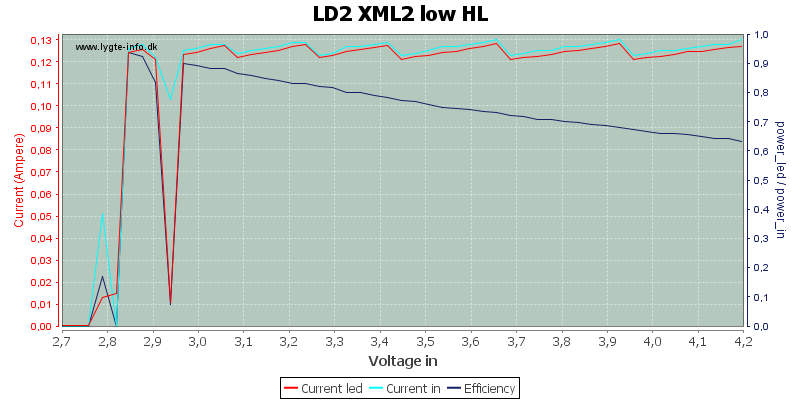 Current in low mode is 126 mA for 6A version. Current in medium mode is 1.22A for 6A version. Current in high mode is 6A for 6A version. 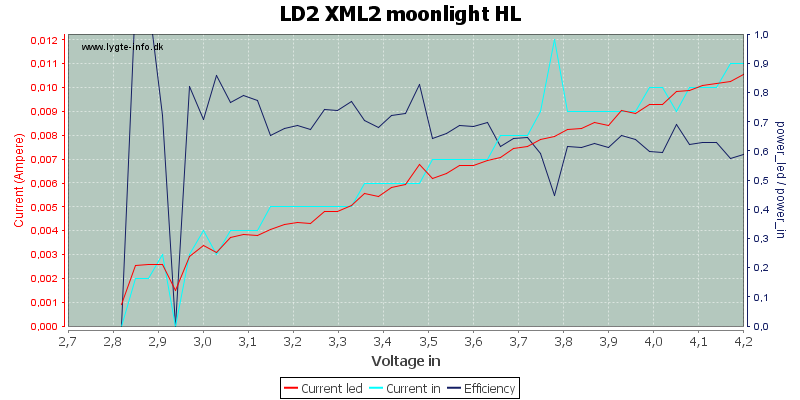 With 6A current the led has a fairly high Vf and the driver cannot maintain full current. 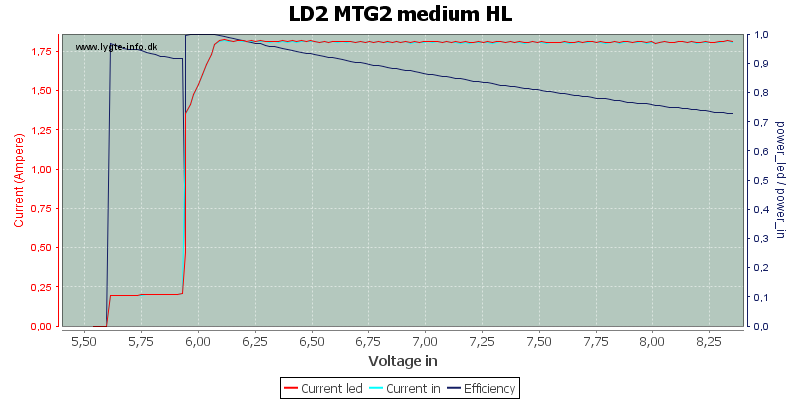 Here the very low resistance in the driver helps to get as much light as possible. Just below 3 volt there is a warning flash from the driver and soon after that it turns off. 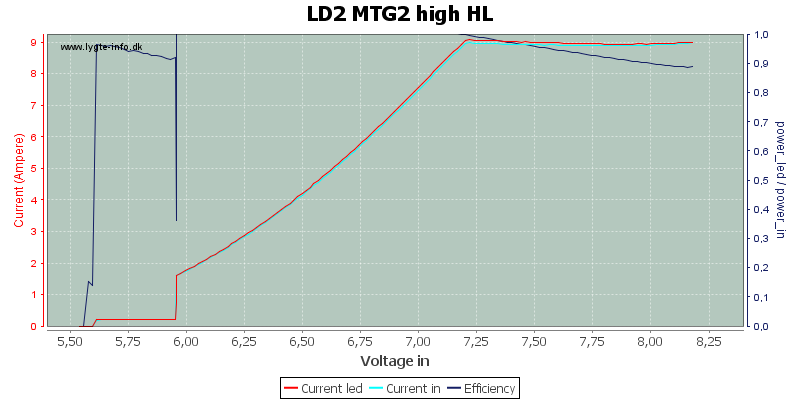 When the driver is using linear regulation it needs to get rid of some heat, but when the battery is down to the Vf voltage there is not much heat in the driver. Driving a XM-L2 led with 6A is 22 watt. 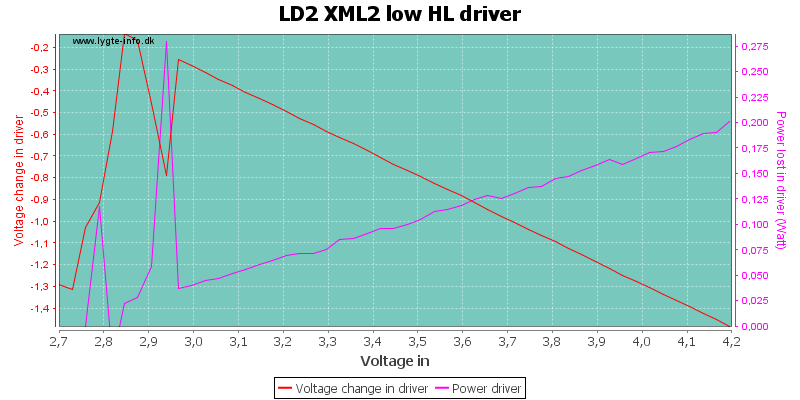 Here is a more detailed look at the driver where the actual voltage loss can be seen (I measured it with a separate DMM for this curve). 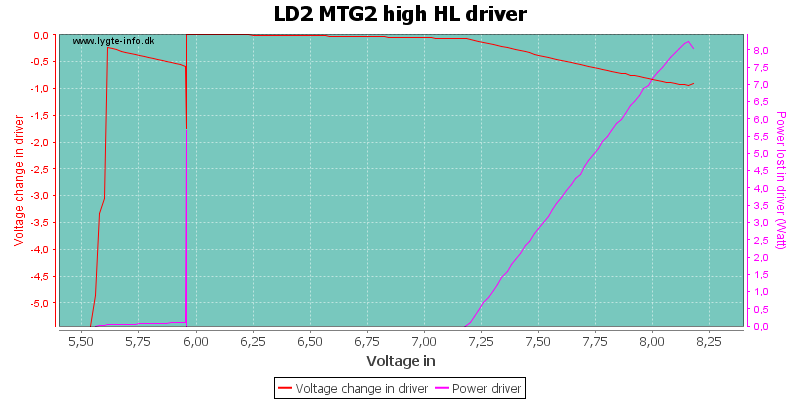 I have also calculated the resistance in the driver, the 6mOhm specification looks about correct. Medium is "only" 1.2A and the driver stays in regulation most of the time. The warning flash and turn off is also present here. 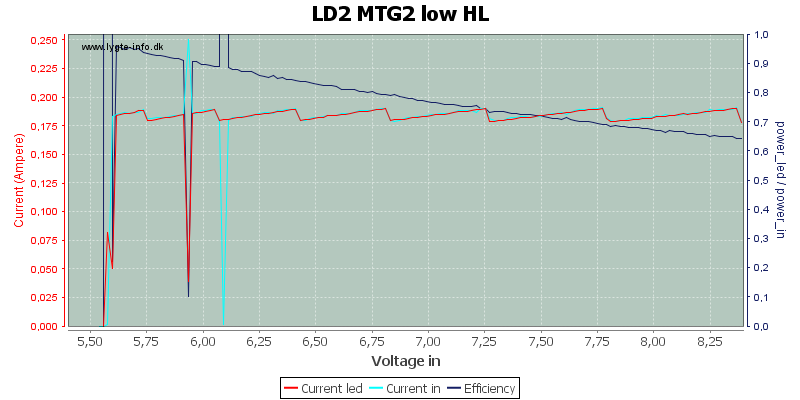 The power loss in the driver is not much lower than high, because the Vf is much lower.. 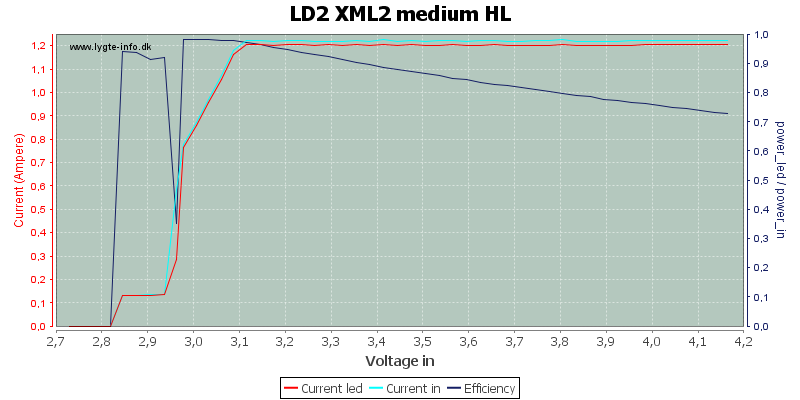 In low mode the current regulation is not completely smooth, there is not enough resolution in the driver circuit for it, but it is only a 5% change. 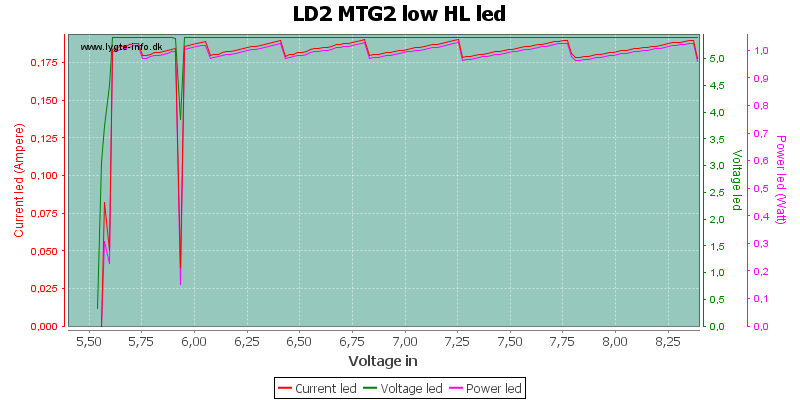 In low mode I hit the resolution of my power supply and cannot show a smooth curve. The real curve is smooth because it is a resistor, there is no regulation in this mode. The tested version is a 6V led with a rated current of 3A. 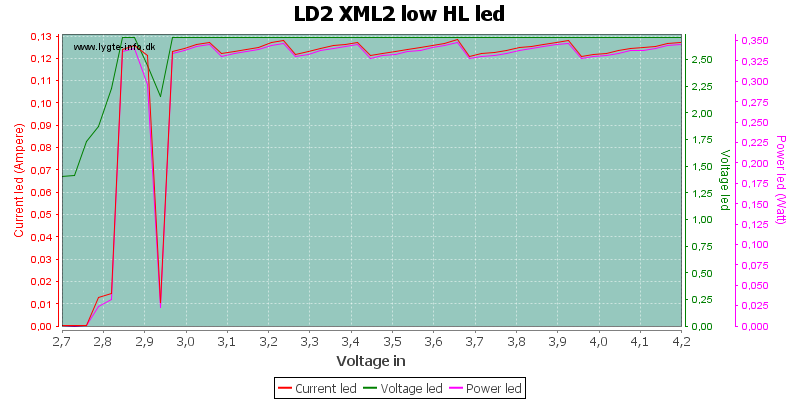 The driver is running this led at 9A as long as there is voltage enough. 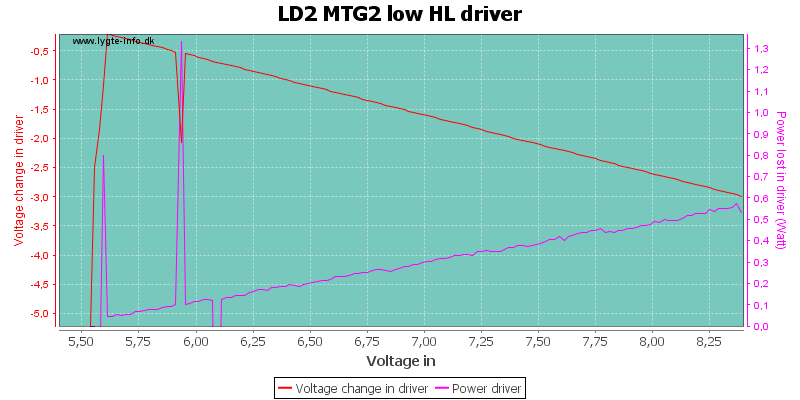 When the battery voltage is down to 7.2 volt, the driver is using direct drive. At about 6 volt the driver will reduce brightness. It is important to give the driver good cooling, at least when the batteries are fully charged. 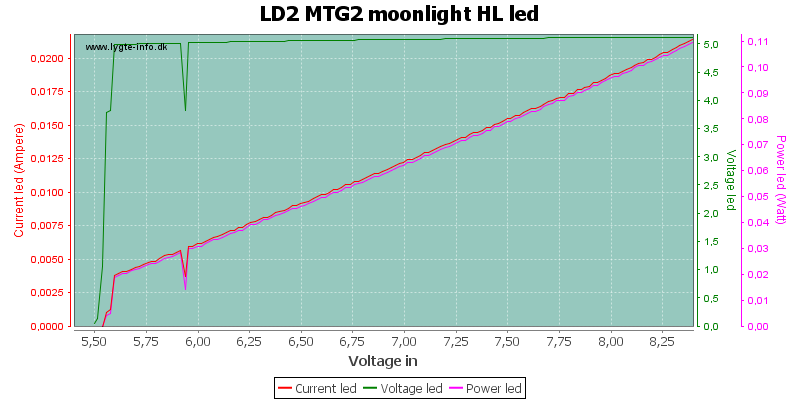 The led also needs a lot of cooling with 65 watt in it. In medium the current is about 1.8A and can maintain full brightness down to 6.1 volt. The driver still has some watts it need to get rid of. 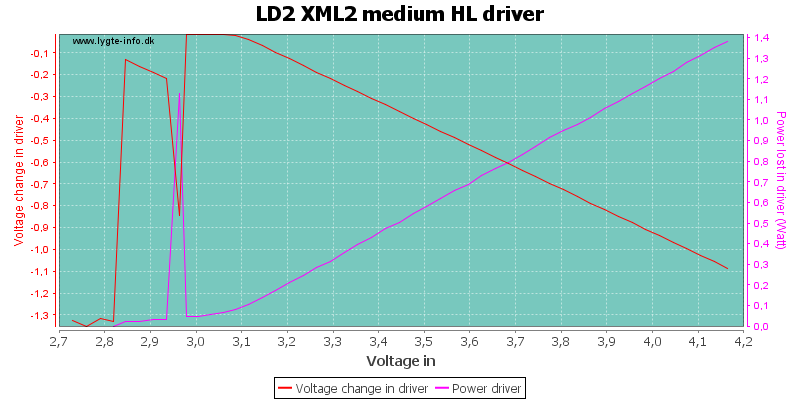 As with XM-L2 the regulation in the driver can be seen on the curve in low mode. 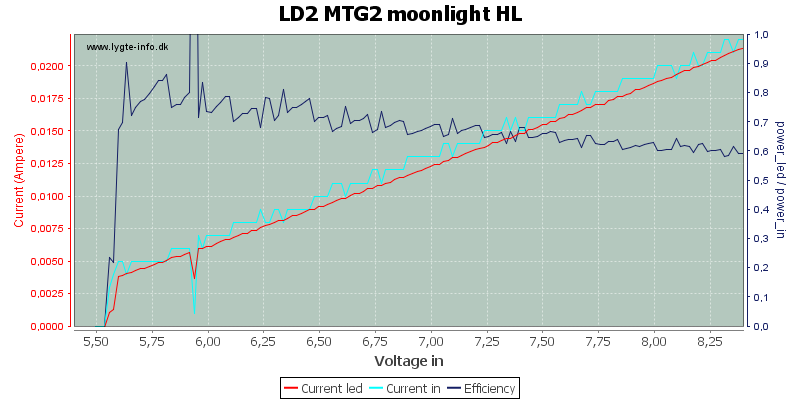 Moonlight mode is just a resistor, there is no regulation. The "noise" in the curve is due to limited resolution in my equipment. The different brightness settings, here selected from UI1. When selecting high there is a bit of overshoots, where does it come from? 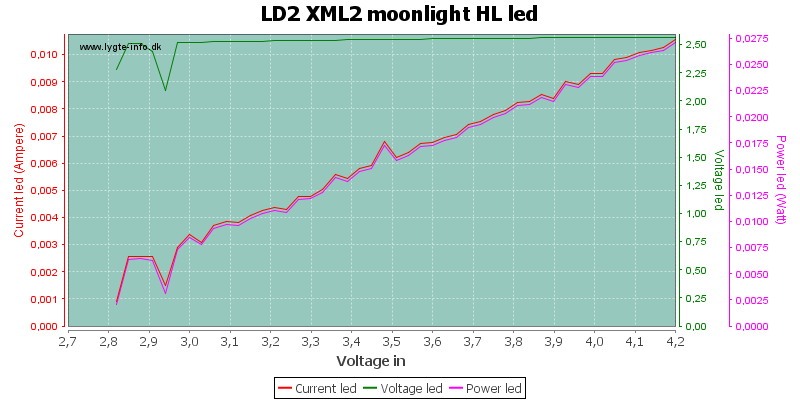 Adding a current trace on the scope shows that the current is nearly without overshoot, it must be from the led, i.e. 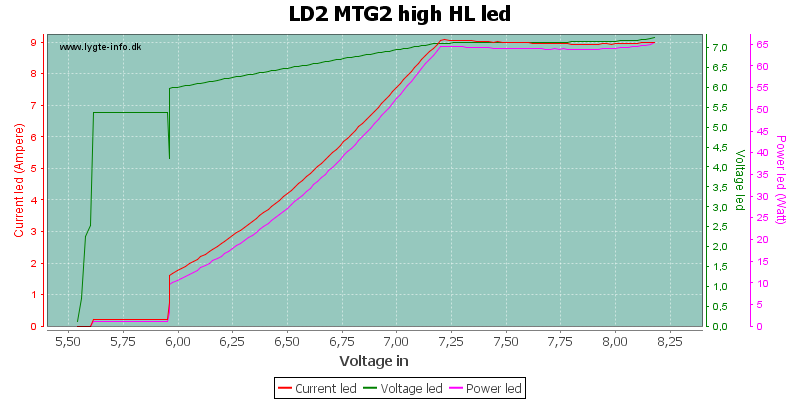 the peak brightness of the led drops a bit very fast when using high current. In UI2 the button must be held down and release when the correct brightness setting is reached. In UI3 a double press is used to change brightness and a single press is used for on/off. 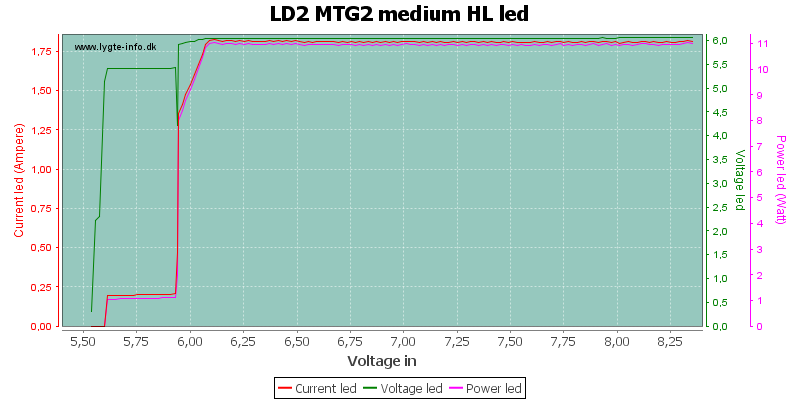 I got a NTC from led4power to test the temperature with, but I run into a few problems soldering wires to it (I need a clamp to hold small smd parts). 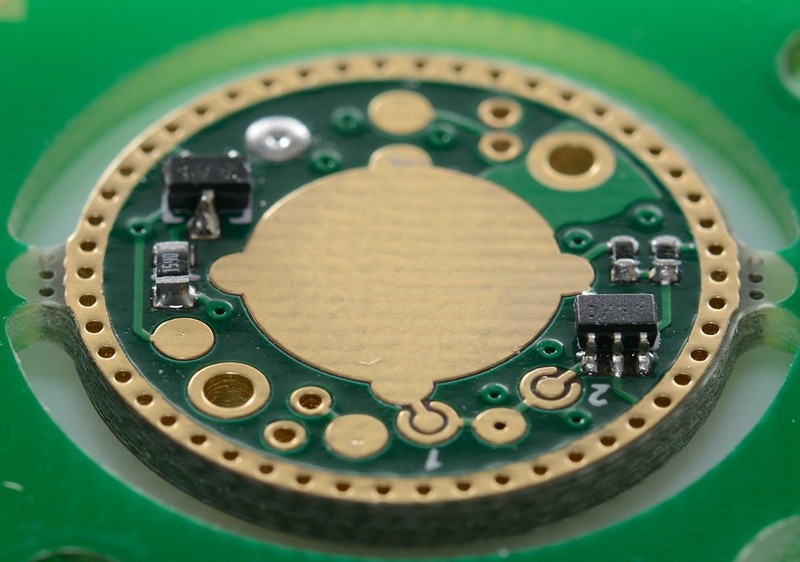 The NTC was not necessary to test the temperature stepdown, a decade resistor is much better. Here I can adjust the temperature at will and see how the driver handles it. When the led get to hot it drops to medium mode or lower when required, when the temperature drops it will increase to medium again. The UI is changed by holding down the button for 10 seconds. 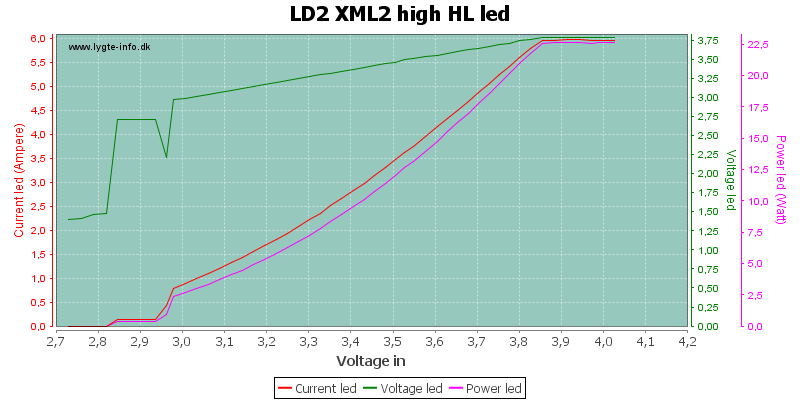 One of the advantages with a linear driver is the much better efficiency at lower current, this is especially true when overdriving a led as significantly as this driver can do. In the above table I have defined 6A as 100 percent and then calculated the lower ranges according to this. At medium the drive current is 1/5, but brightness is only 1/3 down, this means we get 64% more light than a pwm driver with 6A current adjusted to 20% duty cycle. Same as above, but this time with the MT-G2. 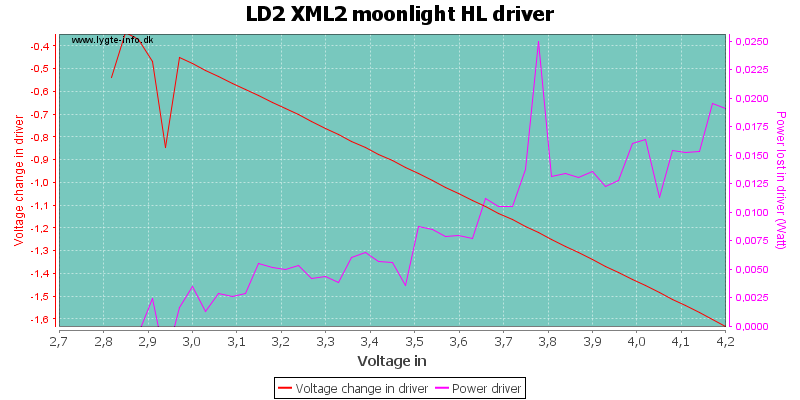 The driver is a nice upgrade to the LD-1 driver, the external temperature sensor is a good addition for overdriving a led and still keep a bit of control. With its very low resistance it can match direct drive when necessary, but still has the advantage of linear drive and current limiting with a fresh high current battery and in the lower modes. 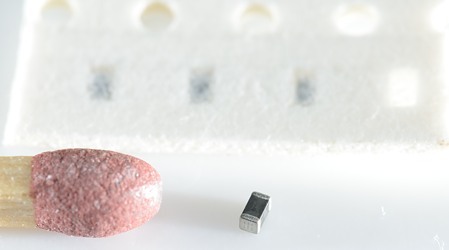 The ability to change maximum current by changing a normal low power resistor is very nice, but it requires some experience with smd work to do it (It is a very small part). Support for both one and two cell lights makes the driver very versatile. I believe this is a very good driver. 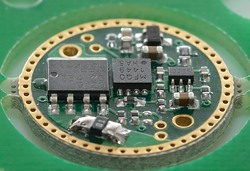 The driver was supplied by BLF user led4power for review.